Here at Think, we have a lot of changes happening that we are very excited about. First and foremost, we have a new website design at WeLoveToThink.com that we love! The homepage showcases our portfolio that will be constantly updated as we complete projects. 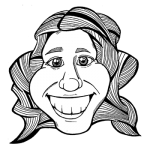 You can read About Us, check out our sweet caricatures on Our Team page, and follow us on our advertising journey through this Blog. We hope the new website broadcasts that we are laid-back, friendly, and very passionate about our talents. Our ultimate goal in 2013 is to build better relationships with our clients so we can progress together. From business cards to television advertisements, Think can handle any project big or small. Visit our Services page to learn more about how we can work together to accomplish your goals. We want to stay in touch with our clients (and soon-to-be clients) through monthly newsletters that include valuable information, not spam. You can sign up for our Think Tank emails at the bottom of this page. The first week of each month, the Think Tank emails will contain: (1) our blog articles that we have been publishing, (2) exciting information about print, advertising, graphic design, and small-business ownership, (3) a fabulous coupon to be used within the next month on your next print or promotional order! We hope that you will find the information relevant and will look to Think as an educational source as well. Think, L.L.C. 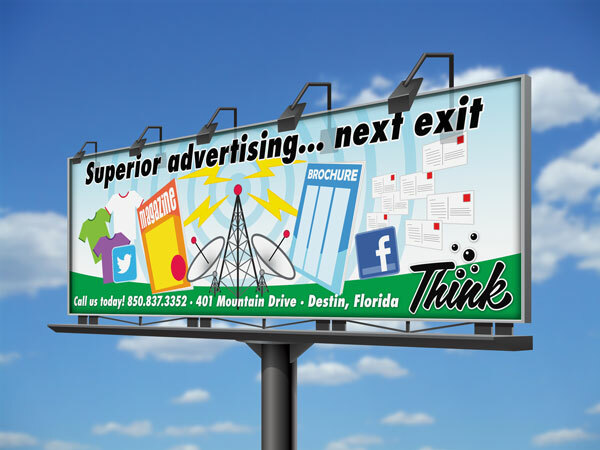 is an advertising agency, printer, graphic designer, and publisher in Destin, FL with an office located at 401 Mountain Drive. We specialize in logo design, editorial/advertisement design, custom illustrations, media & advertising placement, advertising budget management, social media management, video production & editing, radio production & editing, website design & hosting, Search Engine Optimization, EDDM (Every Door Direct Mail) campaigns, business card design & print, restaurant menu design & print, photography, rack card design & print, flyer design & print, brochure design & print, sticker/vinyl decals design & print, complete publication design & print, banner design & print, design & print of various signs, and promotional products. Our prized publications include TheMenuMag: The Ultimate Guide to Dining and Nightlife, and Conquer: The Ultimate Guide to Adventure and Fun which are distributed to thousands of tourists and locals along the Emerald Coast. Visit WeLoveToThink.com, ThinkMenuMag.com, ConquerDestin.com, and ThinkLovesToPrint.com for more information about our wide selection of products and services.